Salsateca, Ola Latina and The Latin Passion (Peynao ‘er Bachatero’) are delighted to host LATIN PARADISE… a welcoming and friendly Salsa & Bachata party night on the Last Friday of Every Month, at the majestic Great Hall, Bromley Civic Centre, for the pleasure of all Latin music and dance aficionados in South East London and beyond. 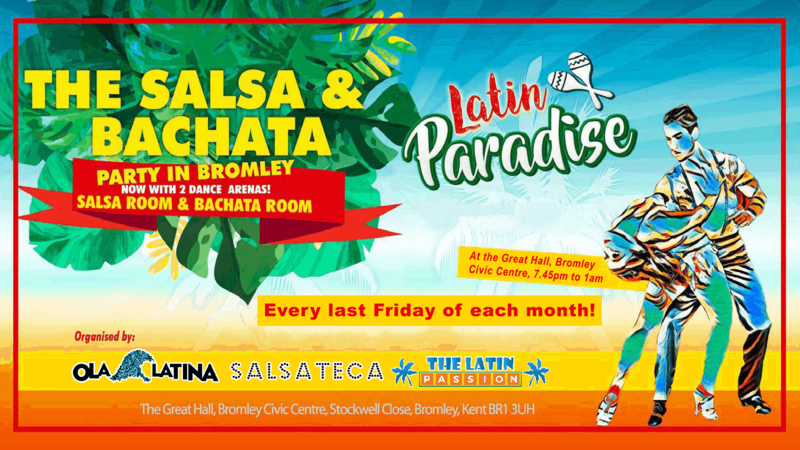 This event brings Latin fireworks every month to Bromley with an infectious, passionate and friendly atmosphere. The night will showcase an array of top and well established dance instructors, performers and DJs from the Latin dance scene from London and the UK, with occasional international guests from abroad. You will learn: Bachata in fusion of styles (Sensual, Traditional, Modern, Bachatango, etc). You will learn: Salsa Crossbody L.A. Style. Salsa & Bachata Parties in 2 separated rooms with top London UK DJs in both styles. Latin Paradise opens every Last Friday of each month. Our next Bimonthly Half Price Voucher for May and June will be available from the beginning of April. Stockwell Close Bromley BR1 3UH.